MOCRUX Wi-Fi Smart Plug - can be controlled from anywhere via free "smart life" or "Tuya Smart"app.How amazing. You can control your house simply by a APP whenever and wherever. Hands-free voice control - At the sound of your voice, you'll be able to control appliances. Create schedules to devices - allows you to create customized schedules for your appliances. 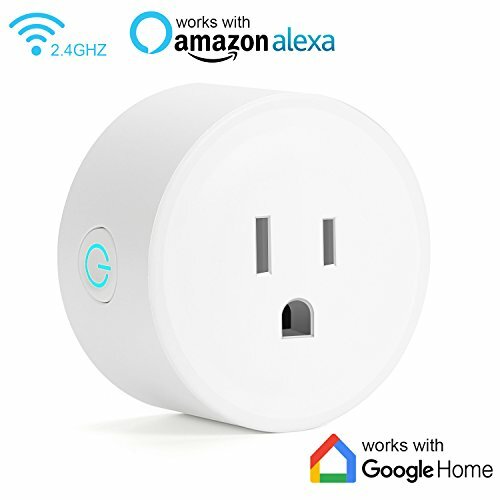 Easy to set up - No need for electricians and tech geek knowledge to install and use our smart home devices. Energy saving - Keeps energy use low when you're not home. Certified Safe - FCC CE RoHS Certified makes it more trustworthy. Perfect Customer Service - Customer is our most valuable asset. All our work is around our customer and to ensure 100% customer satisfaction. We have a dedicated team to support you before and after the sale. 1. Scan the QR code to download"Tuya Smart"or"Smart Life"app from App Store or Google Play. 3. Select Add Device or the "+" icon. 4. Make sure the indicator light is flashing quickly,then tap the related button in application. 5. Choose the local WiFi and enter the correct password,tap"next". 6. Input the WIFI password to your device and then tap "Done".